Rice is the staple food in Japan. 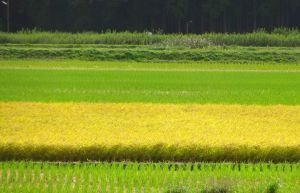 In September, rice ripens and is harvested across Japan. 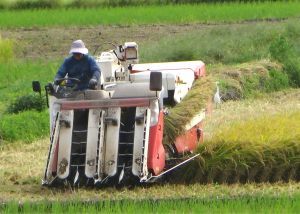 Then the freshly-harvested rice is made available on the market. When cooked, new rice is soft, glistens, and has a faintly sweet taste. People look forward to tasting it each autumn. Rice is used in many dishes: sushi, "onigiri" (rice balls wrapped in dried seaweed), "ten-don" (a bowl of rice topped with tempura), and curry with rice, to name a few. It is also used as an ingredient in miso (fermented soy bean paste), rice vinegar, and sake. For Japanese people, rice is the most significant food and for farmers rice harvesting is one of the most important events of the year. 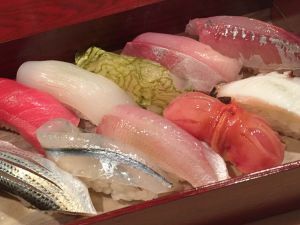 You can eat sushi, the most popular Japanese dish for foreigners, at the Sushi Bar ENJI. ENJI serves authentic sushi and unique sushi rolls that appeal to foreigners’ taste. The chef worked as a sushi chef in the US for more than a decade. He understands your needs well.